It is an exciting time to establish yourself in cybersecurity as cybercrime is not the only thing on the rise but the demand for cybersecurity professionals continues to grow but the potential opportunities with highly recognized companies also grow. P. Morgan Chase and Co. has doubled its annual cybersecurity budget from $250 million to $500 million. Microsoft Corp. invests over $1 billion annually. Bank of America has considered allocating unlimited budget to combat cyber incidents. 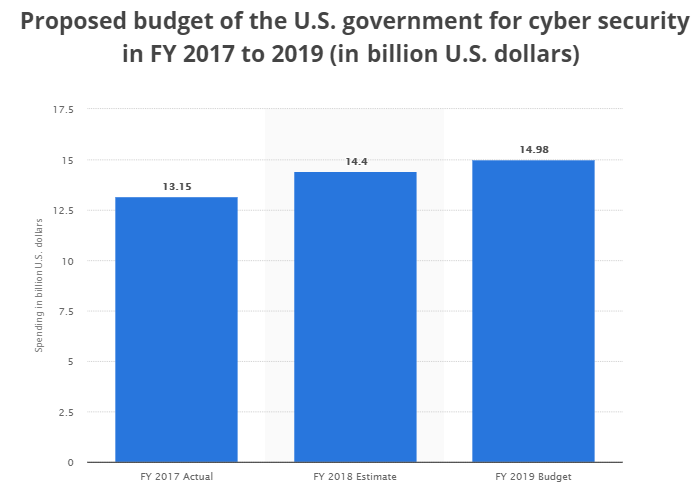 The yearly increase in the proposed cybersecurity budget by the U.S. Government represents in overall growth in the federal resources for cybersecurity, which is a necessary investment for the IT security of the nation. Considering the above statistics, we can say that the industry is still fresh and continuously evolving. A career in cybersecurity that started today, can go miles ahead in the years to come. Coming from a technical background will be an added advantage while trying to enter the cybersecurity industry. Cybersecurity is mostly influenced by IT for the simple reason that both intersect and overlap. Possessing technical skills will help you decode computer-related aspects at a faster pace when compared to those from a non-IT background. The skills that you carry as a programmer, developer or software engineer can be quickly transferred into related cybersecurity roles. Test the network for vulnerabilities, monitor the server, and have a detailed strategy on assigning the access to the information data. Verify every device connected to the network. Ensure the safety of the network along with all the devices connected. Conduct ethical hacking on the system, process, and application. Identify and locate vulnerabilities and report the same to the management. Implement and practice new methodologies on ethical grounds. Focuses on testing methodologies to identify and mitigate risks for the security of the company’s IT infrastructure. Provide ethical hacking, pen testing, vulnerability assessment, and secure wireless network using various methods and processes. Investigate network, systems, and all other digital devices, and collect evidence. Report, analyze, and store the evidence with the utmost care for future reference. Having a non-technical background to get into cybersecurity is not a demerit. You don’t have to find a technical position to learn the skills and get into the industry. You can still opt for non-technical job roles, like that of an IT Security Auditor. Besides, to grow in cybersecurity, you can always build on your existing knowledge to help you move towards more successful and in-demand career paths like ethical hacking. Develop strategies, procedures, and policies for public and private enterprises. Assist clients in implementing the defined policies. Analyzing the incident and collecting the available evidence. Determine the extent of loss or damage due to an incident and analyze the containment period. Though you can always begin a career with the skill-set that you already possess, acquiring a good position and achieving growth in the industry would involve attaining a bachelor’s degree. EC-Council University which specializes in cybersecurity education offers a Bachelor of Science in Cybersecurity (BSCS) two-year degree program that is 100% online. The program guides technical professionals through the best security practices and implementation of security standards throughout the IT infrastructure. For non-technical professionals, the bachelor program helps in gaining intense technical knowledge related to cybersecurity. Through the BSCS program, the student also attains three main cybersecurity certifications from EC-Council. The career scope in cybersecurity is immense. In order to keep with the pace, one should be prepared to learn and upgrade continuously. Getting a job in cybersecurity does not assure a safe career path. Striving to improve and learn new technologies will help you stay ahead of others in the industry. After the BSCS, you can join the Master of Science in Cybersecurity program with EC-Council University. The MSCS program will give you the option to specialize your interest in a prospering career. Along with the master certification, you will also be entitled to receive industry-recognized credentials from EC-Council which will add wings to your career. PreviousPrevious post:What Is a Vulnerability Assessment?